Just found this article from the May edition of the Observer Food Monthly, but better late than never right? Preferably in Provence. The smell is a mix of pine and cigarette smoke with the occasional strong hit of goat cheese. 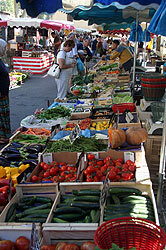 Cogniscenti head for the Var area, particularly the markets of Cotignac (summer only), the bustling town of Salernes (Wednesday and Saturdays) and Aups (famous for truffles). Having left the country, we’re finally enjoying the Indian summer that we hoped we would have at home. Here in the south of France the sky is cloudless, the days are still warm and the vines are heaving with fruit.